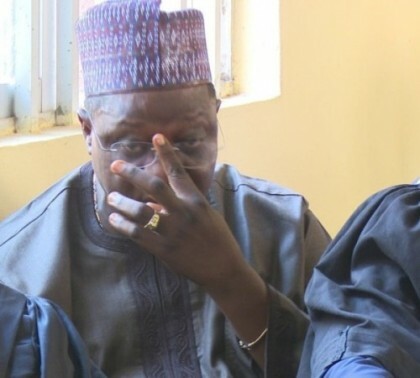 Former Plateau State Governor, Joshua Chibi Dariye’s N1.6b trial continued on Monday, October 17, 2016 before Justice Adebukola Banjoko of the Federal Capital Territory (FCT) High Court, Gudu, Abuja, with a defence witness, Paul Datugum, a staff in the Office of the Accountant-General, Plateau State Ministry of Finance, failing to substantiate an alleged raid by operatives of the Economic and Financial Crimes Commission, EFCC, on the Ministry in 2005. However, under cross-examination by the counsel to the EFCC, Rotimi Jacobs, SAN, Datugum, who admitted that the Ministry of Education building was some meters from the Ministry of Finance, said he did not see the particular documents that were allegedly carted away by operatives of the EFCC. “I did not see the particular documents; I did not see the contents either. But they were documents because they were packed inside Bagco bags (Jute bags),” Datugum said. “You remember you said in your statement that you spent days looking for the documents, without being able to identify them,” Jacobs added. Dariye is currently charged by EFCC with N1.6b misappropriation of Plateau State government funds. Joshua Chibi Dariye was born July 27, 1957, elected and assumed office as the Governor of Plateau State May 29, 1999, on the platform of the People’s Democratic Party (PDP). He was re-elected for another 4year term starting in May 2003, and was impeached in November 2006. In April 2011 he was elected Senator for Plateau Central on the Labour Party platform. Dariye last month Dariye decamped to the governing party, the APC in a letter address to senate President and read on the floor of the Nigerian Senate by the senate President Bukola Saraki.